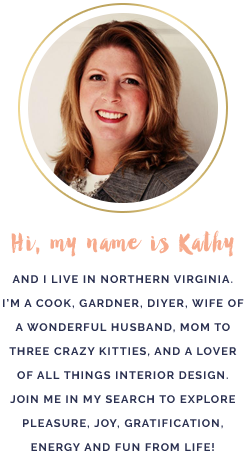 I’ve spent a little time tweaking things around here and the new template, but still have a few things to add and adjust. That will come. I also took advantage of this time to take a little break, but that doesn’t mean I haven’t been busy! 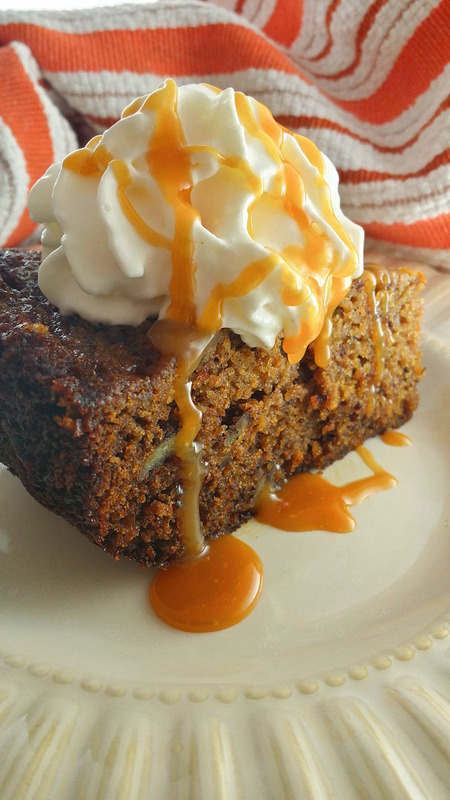 This bread/cake is AMAZINGLY moist and stays moist for days afterwards. 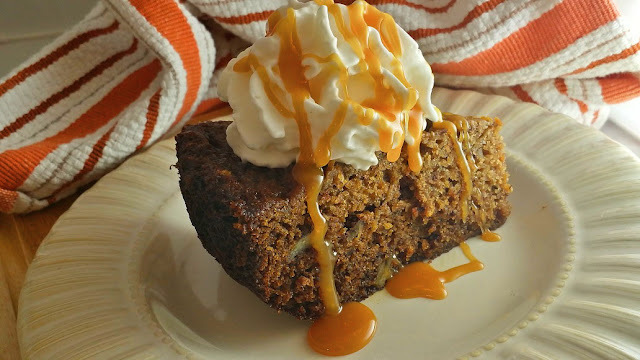 It is so good, that I think I may have found a replacement recipe for my Cream Cheese Banana Nut Bread. I originally got this idea from Mom on Time Out's Slow Cooker Pumpkin Pie Cake recipe, which is amazing as well. The only downside that I have found so far is the baking time, but really, you can just set-it-and-forget-it if you want to go off and do other things for a few hours. How awesome is that? And when you come back, the house smells like someone is baking something special just for you. Can you imagine whipping up this batter beforehand and cooking it in a Crockpot at work for your next potluck luncheon? I can. Line slow cooker/crockpot with a tin foil sling. Follow Mom on Time Out's example for how to make a tin foil sling. Spray tin foil with Pam. Cream butter with sugar until pale and fluffy; add eggs one at a time, mixing well in between. Add the mashed banana and vanilla extract and mix till incorporated. Combine the dry ingredients together first (or sift) in a bowl, then add to the banana mixture. Mix until incorporated, but don't over mix. Hand stir in nuts. 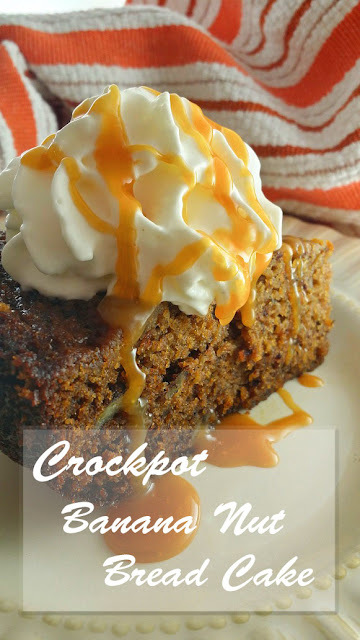 Pour batter into slowcooker/crockpot and cook 2-3 hours on high. 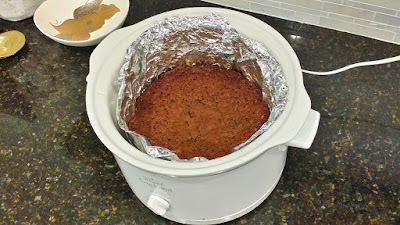 Rotate tin foil sling halfway through baking to avoid over baking or burning on hot spots in your Crockpot. Start checking cake around 2 hours and test with a toothpick or butter knife. Cake is done when a toothpick or butter knife is inserted and comes out clean. 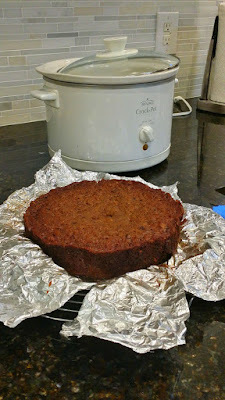 When finished, remove cake using the sling and place on a cooling rack. Peel tin foil away to allow to cool. Then try not to eat it all!